One of the lounges that I was most excited to try on my layover in Hong Kong was the recently opened Qantas Hong Kong lounge. This is one of the newest lounges in Hong Kong, and it’s definitely one of the best business class lounges I’ve been to. The lounge is large and long. It’s open to the rest of the terminal, so it’s maybe a little noisier than other lounges, but it gives it a nice airy feel. There are lots of different seating options that are thoughtfully spaced out, and there are tons of electrical outlets. 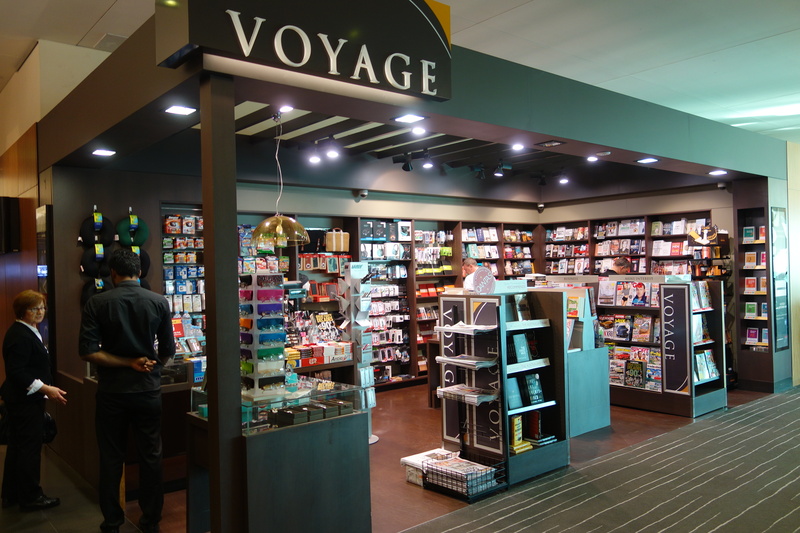 It’s very smartly designed with the business traveler in mind. There’s a wide variety of food options, although they’re almost all Western foods, which is a plus or minus depending on your perspective. I thought that the food was relatively mediocre when I visited, but I appreciated the variety and the availability of healthful choices. I specifically enjoyed the Japanese sweet potato and salted caramel cheesecake that I tried. For a business class lounge, this lounge is awesome. I think it’s even better than the Turkish Airlines Lounge in Istanbul just because that lounge is so crowded. This lounge has a wide variety of food, tons of seating, tons of outlets, good wifi, and showers. It’s located above Gate 15. Hong Kong generally has great airport lounges, and this is no exception. Depending on what kind of food you’re feeling like and/or how willing you are to deal with other people, this is a great place to go. This entry was posted in Lounge Reviews, Qantas, Travel, Trip Reports and tagged airport lounge, business class, hkg, qantas, travel, trip report on July 9, 2015 by Edward. Besides flying Qantas First Class on the A380 (which turned out to be a really disappointing experience), I was super excited to visit the Qantas First Class Lounge in Sydney, given that I had heard it was one of the best airport lounges in the world. While I didn’t get to try the complimentary spa services (which have been shortened over time) since I was at the lounge after the spa had closed, the parts of the lounge that I did try were very good. My first order of business was to eat some food. The Qantas First Class Lounge has a proper dining area with table service. They have a pretty extensive seasonal menu, and I may or may not have gone slightly overboard with ordering (essentially, I said yes to everything that the server recommended). I tried the grilled sesame tuna, the cobia sashimi, the salt and pepper squid, and the fettucine with soft egg (minus the bacon). For dessert, I had the chocolate croissant bread and butter pudding and the pavlova. The food was good–easily some of the best food I’ve eaten at an airport. I think I still prefer the food at the JAL First Class Lounge at Narita, but then again, I’m Asian (obvi). I think most people will find some things that they’ll enjoy a lot. The decor of the lounge is pretty cool. It’s one long, curved room with large windows that provide some fun airplane viewing. There’s plenty of seating, and lots of areas to get work done, have some privacy, or talk to others. The majority of people were in the dining area when I was there, so that area did get a bit crowded, but the lounge is spacious. The service in the dining area was good, but I’m not sure if there’s much service outside of the dining area to speak of. No one seemed to be going around to check on people or offer drinks, but perhaps that was because it was late at night and most passengers were in the dining area. Overall, this is a great lounge. While Qantas’s onboard product left me underwhelmed, the First Class Lounge in Sydney is a great airport lounge. This entry was posted in Lounge Reviews, Qantas, Travel, Trip Reports and tagged airport lounge, first class, lounge reviews, qantas, sydney, travel, trip report on May 29, 2015 by Edward. After being impressed by the Qantas Domestic Business Class Lounge, I headed to my short flight from Melbourne to Sydney to check out Qantas’s domestic business class in-flight offerings. I was immediately impressed by the cabin. 2-2-2 seating in business class with pretty comfortable seats, although the pitch was pretty tight. The cabin was completely full. I was offered a pre-departure beverage of water or a cranberry drink, but it was offered so late that I had less than a minute to down it before they collected the cups. There were iPads located in the seat back pockets for in-flight entertainment, but I didn’t understand how to operate it, so I got a flight attendant to reset it (I am potentially incompetent, but my seatmate also could not get hers to work). Once it was working, however, the system was responsive and had a pretty good selection for a domestic flight. Unlike US-based airlines (but similar to most airlines everywhere else), there was a meal service in business class on this very short flight. There was a choice between sweet corn chowder, something like a Waldorf salad, and a ham and cheese sandwich. I selected the chowder, which was pretty tasty for airline food. And the sourdough bread accompaniment was better than most airplane bread, even in first class (main exception off the top of my head: JAL first class bread), and it was given out generously. The dessert cake was also good. Overall, this meal was tastier than any meal I’ve ever had on a domestic US flight. Pretty soon, we were flying into Sydney, and we got to enjoy some awesome views of the city prior to landing. Overall, I was very impressed by Qantas domestic business class: comfortable seats, good in-flight entertainment, a genuinely tasty meal, and courteous service. Not sure what else I would ask for on a short hop like Melbourne to Sydney. 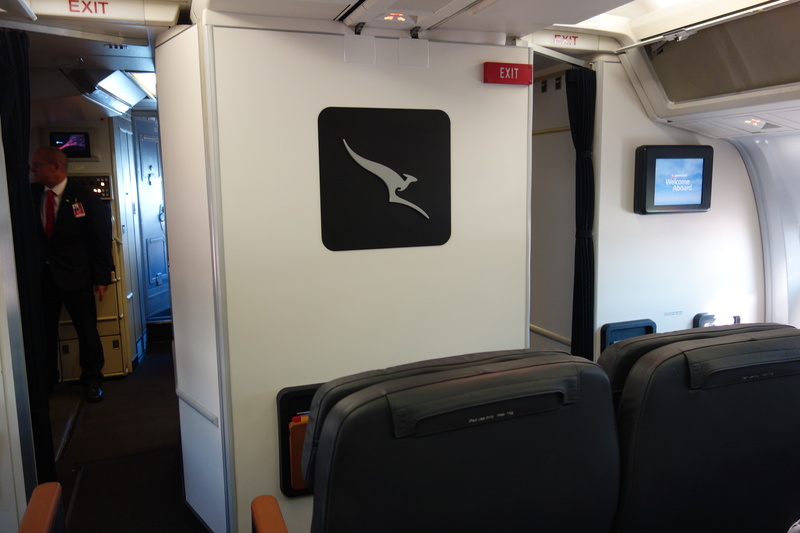 This entry was posted in Qantas, Travel, Trip Reports and tagged business class, domestic, flight review, qantas, travel, trip report on May 9, 2015 by Edward. After leaving the new oneworld lounge, I walked to the gate and admired both the new TBIT terminal and all of the A380s sitting at LAX. I think I saw China Southern, Korean, Lufthansa, and British Airways, in addition to the Qantas A380 that I’d be flying. Boarding was delayed by 15 minutes at first, then again for another 5 minutes. In general, the boarding process seemed like a bit of a mess. When I boarded, I was welcomed on board, but I wasn’t shown to my seat. I know this is a trivial thing because I clearly know how to find my seat, but I’ve found that it’s a decent barometer of how good the crew is. As in, if they don’t show you to your seat in first class, you probably have a pretty bad crew (spoiler alert: this crew was pretty bad). I took a couple of pictures of the cabin before it filled up, and I also snuck upstairs to take some pictures of the business class cabin as well. The first class seats are a little interesting in that they swivel, so they’re forward facing for takeoff and landing but get angled when you’re lounging/dining/sleeping. The seat was plenty spacious when angled, but it wasn’t very impressive when facing forward. 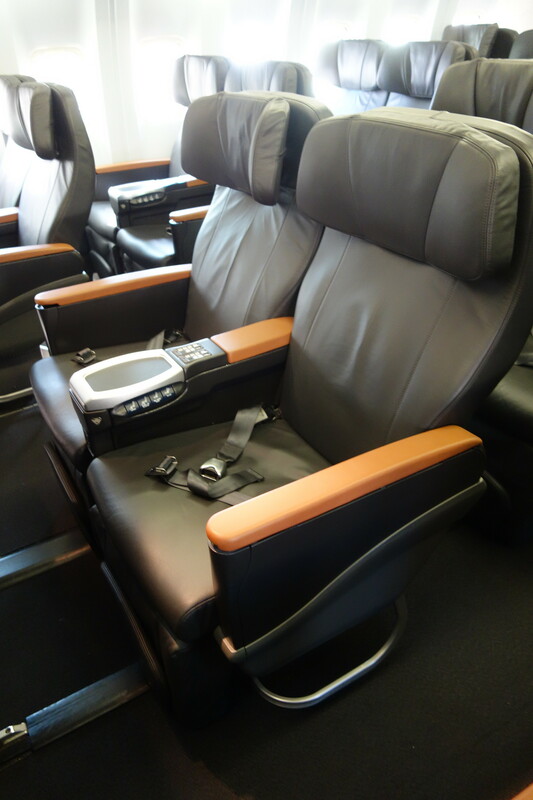 Qantas also puts 14 seats in their first class cabin on the lower deck of the A380, which is on the higher side. Upstairs, they have a small lounge in the “dead” area on the A380s (where Emirates places their showers), which didn’t seem to get much use throughout the flight. I went up a couple of times and just stole snacks from the business class bar (mostly because the service was so bad in first class that I couldn’t get the attention of the flight attendant so it was easier to serve myself from the business class bar). Upon returning to my seat, I was offered a pre-departure beverage, pajamas, and amenity kit. The amenity kit is made by SK-II, which I have since been told has really nice toiletries. The pajamas were pretty nice and quite similar to British Airways first class pajamas, but Cathay Pacific still has my favorite airline pajamas. The amuse bouche was crackers, hummus, and olives. Basic, but satisfying. It was a smaller portion than I’ve seen on other trip reports, but the meal service on this flight is generally slightly abridged given that it’s a night flight, which could have explained the smaller portion. I’ll also say that there weren’t any refills offered, even though we had a half-hour delay on pushback. Here are pictures of the menus for the flight. Again, it’s a slightly abridged menu given that it’s a night flight, so there’s no tasting menu on offer, although you can make your own sort of tasting menu by ordering as much food as you want. 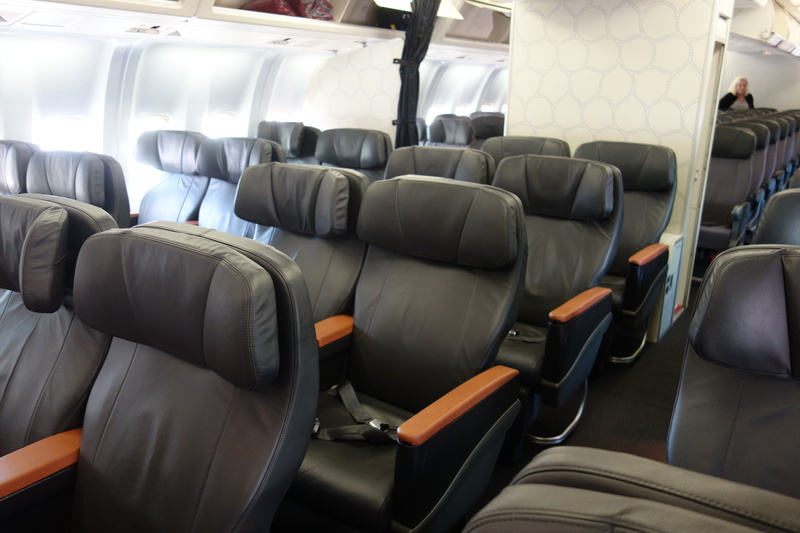 Only 6 out of 14 seats were assigned the day before the flight, but the flight went out 13 out of 14 in first class. The left side of the cabin is definitely more private given that the center seats are open to the right side (similar to Cathay Pacific’s first class cabin on the Boeing 777). In general, the cabin felt a little generic and sterile to me. We ended up taking off around 12:30am. I decided to try to stay up a bit to start to adjust to the destination time, so I had the meal service. The service was slooooow. It took me 45 minutes after takeoff just to get some water. And it was even longer just to get a place setting. And the pacing between courses was super slow. Anyway, onto to food itself. I really liked the bread service, given that they had a pretty tasty sourdough. I had the warm duck salad to start, which was quite good. It was quite large, and it was slightly odd in that the the duck was warm and the salad was cold, but it was good, flavorful, and the duck was decently tender. Easily the best salad that I’ve had on a plane, and I wouldn’t have complained if I had eaten this in a restaurant. Next up was the famed Qantas steak sandwich, and I can see why people like it so much. It makes a great in-flight snack. The relish is potent, which is good when your sinuses are dried out from flying since it’s harder to taste. The bread is nice and soft, the arugula gives the illusion of healthfulness, and it’s a sizable amount of steak. One half of my sandwich was overcooked, but I enjoyed the non-overdone half. I could also see this being sold in a restaurant. For my entree, I had the gnocchi. It was better than most airplane pastas, but that’s not saying much. It was clear that the plate had been heated for way too long, but the gnocchi were fluffy and fine. For dessert, I had the orange saverin. It was a bit like angel food cake. I was warned that the ice cream might be a little hard, but that was an understatement as it was served rock hard. Throughout the entire meal, I didn’t get my drink refilled once, even though I asked multiple times. After the meal, I had my bed made. The bed is comfortable, and the mattress pad is super soft. It felt a little exposed to the aisle (and I could easily hear someone in the cabin snoring quite loudly since the seats don’t insulate sound at all), and I wish that the foot area were slightly wider, but these are major #firstworldproblems. The cabin was also a little on the warm side, but there are air vents at the seat. At first, I thought the air vents were lights, but some of them do in fact blow air. I rang the call button a couple of times throughout the flight since the flight attendants never went through the cabin checking on people, and I usually had to wait several minutes before anyone answered the call button. Heck, I’ve had faster responses in coach. For breakfast, I started with the fruit salad (which was marinated in mango juice) and the bircher muesli. Bircher muesli is always so tasty. I then got the scrambled eggs with none of the sides, which were fine. Finally was a toasted bagel with cream cheese, lox, and avocado. I can’t remember ever having avocado on a plane, and the avocado was decently ripe, so that was novel. After I finished eating, I waited. And waited. And waited some more for my plate to be cleared. After waiting for over 20 minutes, I ended up clearing my own dishes and bringing them to the galley. And the flight attendant working in the galley didn’t even say anything. Anyway, if you’re flying from the US to Australia, there are only two choices for nonstop first class. Qantas has nicer amenities and better food than United, but the service on this flight was pretty terrible. The flight attendants were largely absent and extremely slow, and I’ve never had to bus my own dishes on any flight in any class of service. While the nonstop flights are convenient (especially since going through Asia adds a LOT of travel time to get to Australia), this flight was pretty underwhelming for international first class. Given how hard these flights are to get on awards, I would not worry about missing too much. This entry was posted in Qantas, Travel, Trip Reports and tagged a380, first class, qantas, travel, trip report on April 24, 2015 by Edward. I’m sitting in the Qantas Domestic Business Class Lounge at Melbourne, having just got off QF 94 LAX to MEL in first class on the A380. Here are some of my first impressions. 1) The A380 is still my favorite aircraft. There’s something so magical and impressive about the beast, and there are SO many A380s at LAX, which makes for some great plane watching. 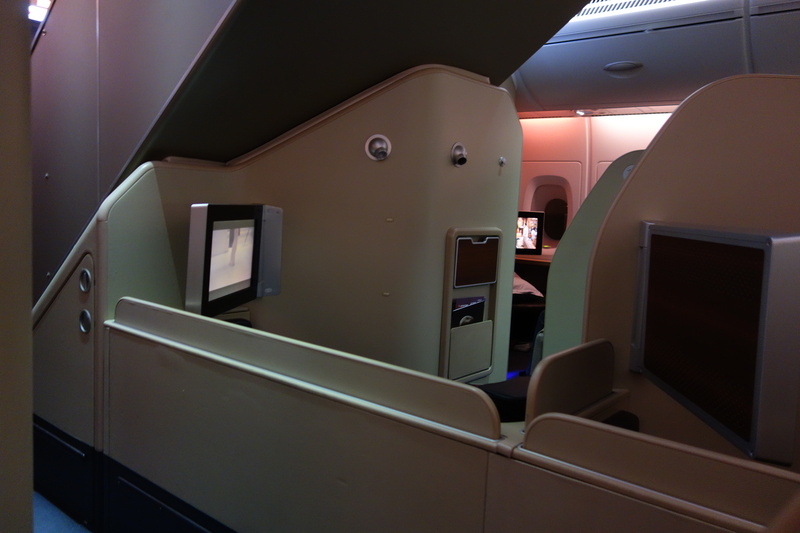 2) Qantas has a solid first class product on the A380s. It’s not a suite, but it’s decently spacious, and the bedding is quite nice. 3) The food is some of the best food I’ve had in the sky. The warm salad of duck confit was probably the best salad I’ve had on a plane. Overall, I was pretty impressed with the food, even if lacks to more typical “luxuries” of first class on other carriers (i.e. caviar). 4) The service… was not great. The crew was perfectly friendly, but they were slooooowwww. Normally, in first class, you can ring the flight attendant bell and someone will be at your side within 5 seconds. Not so for this flight. I rang my flight attendant call bell multiple times, and the quickest response time was over 1 minute. Now, this is of course a first world problem, but one time I rang the call bell and had to wait over 5 minutes before a flight attendant appeared. And there was no apology or explanation for the wait. It got to the point where I even brought my own dirty dishes to the galley since the flight attendants wouldn’t collect them. What kind of first class service is that? 5) I got to go into the cockpit at the end of the flight! And the pilots were much friendlier than the pilots on the Lufthansa flight where I went into the cockpit. Overall, I’d definitely choose Qantas over United for a nonstop first class product to Australia, but I was left puzzled by the slow, non-proactive service. This entry was posted in Qantas, Travel, Trip Reports and tagged a380, first class, first impressions, qantas, travel, trip report on August 26, 2014 by Edward.